This red chile sauce is a great foundation for some killer Southwestern grub. The chiles that are traditionally used for Chile Colorado (red chile sauce) are the ones that are plucked off the ristras. Ristras, those strings of dried chiles that adorn houses in New Mexico are not just for decoration they are used for cooking also. 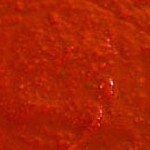 This is a basic sauce that is used in any Southwestern recipe that calls for a red sauce such as enchiladas or tamales or as in the above recipe for Posole.